A big welcome to guest writer Wayne Hewitt, who has penned a detailed review of the soon to be launched Neverwinter MMO. As a pen-and-paper Dungeons and Dragons player from the early 80s, I have always had a soft spot for games set in the Wizards of the Coast gaming worlds. Neverwinter Nights and Baldur’s Gate, both set in the Forgotten Realms are arguably the best in a long list of games. When a closed beta for the up and coming Neverwinter MMO was announced, my Visa card jumped into my hand and begged to be unleashed – who am I to knock back a request like that. So with a small fanfare I was granted access to the closed beta. Yes, you had to pay to be in a beta for a game that is going to be completely free to play. Go figure. As with all betas there has been an amazing amount of changes from one version to the next, and now that the final closed beta has finished up we can look forward to the open beta (which is really a soft launch as there will be no character resets from this point on and anyone can play). The game will launch as a free to play title and if the closed beta is anything to go by, only boosts and cosmetic items will be sold in the cash shop. With all cash shops there is always the fear of Pay to Win, but I think Cryptic have been very conscious of this and have gone with the cash for convenience model. Neverwinter lore is set in the Dungeons and Dragons Forgotten Realms universe. 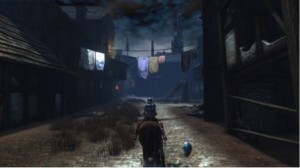 The game has been created by Cryptic Studios in partnership with Wizards of the Coast. It is an action based fantasy MMORPG that uses the Dungeon and Dragon 4th Edition rules as the inspiration behind its game play. Creating a character in Neverwinter starts as it does with virtually every MMO. First select a race and gender. Neverwinter has 7 races to choose from based on the 4E DnD core rules. There is a choice between Human, Elf, Half Elf, Halfling, Dwarf, Half Orc and Tiefling. For me selecting a race was pretty easy – how could I pass up the chance to play a Tiefling (A humanoid with a tail and Horns). Next, select a class. As the game stands in beta there are only 5 classes to play. Cryptic has stated that there are more on the way, but for the moment this is probably the most limiting feature I experienced. The classes stick to the Holy Trinity with a Guardian Fighter (tank), Devout Cleric (heals), Control Wizard (controller – CC specialist / ranged DPS), Great Weapon Fighter (striker – 2 handed melee AOE DPS) and a Trickster Rogue (striker – single target melee DPS). The character customisation was enjoyable. There are an adequate amount of default looks to choose from with sliders to adjust features in the advanced menu. All up I was able to make a character I was happy to play and it had a feeling of individuality that I would expect from an MMO. Neverwinter is of course steeped in lore. A lot of this lore originates from the DnD pen and paper game material, previous computer games as well as a swag of novels (more than 70). The game takes place 100 years after the spell plague and volcanic eruption that destroyed the city of Neverwinter. There is a real feel of depth to the game from the moment you arrive shipwrecked off the coast of Neverwinter city. The first thing that stood out was a golden sparkly trail leading from my character to the first quest giver. Just like the yellow brick road this wonderful trail would lead me from quest area to quest NPC. No more looking at my map staring blindly in an attempt to figure out where I need to go next. This feature can be turned off for the more adventurous player. The tutorial missions introducing you to the story, explain the movement and combat system taking you from the beginning area through to the city gates, leading up to a boss fight on the bridge entering Neverwinter city. 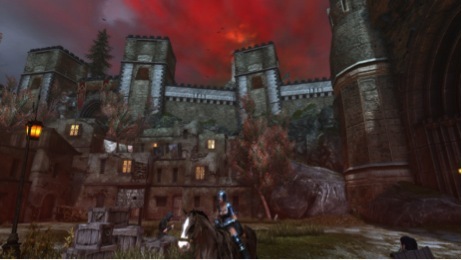 Combat in Neverwinter is a lot of fun and the action based combat is a breath of fresh air in the MMO world. As your character advances in level you gain more and more skills. These skills are made up of ‘At-Will’ powers that are automatically mapped to the left and right mouse button, these are your main abilities and as the name suggests you can use these at will. You also receive ‘Encounter’ powers. These are more powerful abilities that have a short cool down. You can have 3 active ‘Encounter’ Powers mapped to your ability bar. Lastly you have daily powers. Daily powers require action points which are earned through using your other abilities. When you have enough action points you are able to use your daily power. You may map two daily powers to your action bar. After finishing the tutorial you enter into the Protectors Enclave. Here you find all of your merchants, banks, auction houses and other game necessities. I love the views from the Protectors Enclave – they give the game a real sense of the size and grandeur. On first entering the Protectors enclave I did have one of those wow moments when I saw my first player mounted on a rearing horse. This would have to have been one of the best rearing animations for a horse mount I have seen. And yes, when I got my first mount at level 20 I spent a good five minutes making it rear in front of other lower level characters. At level 16 you get a companion. The game has a huge variety of companions that you can acquire from the standard races and classes to animals, magic weapons ghosts and demons. Companions earn experience while they are questing with you and need to be sent off to training to level up. Questing really displays Neverwinter‘s Dungeons and Dragons side, with many of the quests taking place inside instanced dungeons that can be ran either solo or in a party. As you would expect, from a Dungeons and Dragons based game, dungeons come fully equipped with all the things we have come to love. There are monsters to fight, traps to disarm or avoid, puzzles to puzzle over, chests full of treasure, and of course Bosses to kill. Where the questing in Neverwinter really sets itself apart is in the style of quests. The typical ‘go grind X of these’ type quests are rare, with most quests feeling like part of a story, often with multiple parts in different scenarios. The other interesting concept for quests is the foundry. The foundry allows players to created content that is available to all players. By the end of beta hundreds of player created quests and quest chains existed, some as good if not better than the main quest lines. Ultimately the foundry provides an interesting way for anyone to be able to tell their story. Although I only had the opportunity to run a couple of the 5-man dungeons over the beta week ends, I would have to say the first dungeon, ‘the clockwork tower’ was my favourite. As a healer I did at first find the idea of relying heavily on splash healing from my attacks rather than direct heals an odd concept. But as I got into healing with the devout cleric, I came to enjoy the liberty of being able to both heal and attack at the same time. And don’t worry healers, there are some direct heals as well as AoE heals. Questing and dungeons are not the only things to do. There is PvP – both 5 v 5 Arena style matches and 20 v 20 matches. Unfortunately I am not much of a PvP’er so I spent a lot of time dead. Another game mechanic that I found to be enjoyable was the skirmishes. These are quick PvE encounters where a group would protect an area from wave after wave of enemies. I must admit I spent a large portion of my game time playing in these encounters. Even with the mad combat caused by large waves of enemies, the combat system never leaves you feeling overwhelmed. Overall, for a completely free to play game Neverwinter really hit the mark with its questing. Although a lot of the quests are instanced, this is not at all detrimental to the game play. If anything it enhances the feeling of a Dungeons and Dragons game. I did spend a lot of time running around with friends and we were able to do all the instances together and having an absolute blast doing it. There are plenty of large open areas for questing as well, with great opportunities to run into other players. I must admit I would have liked to see a larger variety of classes at launch, but I am sure they will not be far away. The classes presently available are a lot of fun to play. See you all at launch on the 30th April! 30th April, WTF? this game had absolutely no marketing lol. – Preview and review articles in every single gaming magazine and on 95% of the gaming websites out there. – Massive closed beta weekends with beta key give-aways with all major outlets that usually give away beta keys. The last one had 100s of 1000s of people playing the game already. I would love to play a tiefling, except, I’d want to play as one from 2nd edition. They were much more awesome back then. Launch is here as of 2 am Australian times. Well the servers have been flooded, And as a result the launcher web server where not able to cope and have promptly fallen over. Those that did get in have struggled with large Lag spikes. Cryptic have come out with a large very honest post of the issue, What has happened and what they are working on to fix it. hopefully this should be fixed by the time I get home from work.Communication is a good thing, and very rare in the gaming world. From the looks of the forum posts STO has also seen some issues today, This may be due to many of their web services being shared. Well if it is any consolidation I have been playing for the last 5 days with no issues and enjoying the game. The servers are hosted in Boston, and the ping from Australia/New Zealand is 300ms-380ms constant. So this game is not recommended for Oceanic players.